Tales of Adequacy No. 400 | Tales of Adequacy! Bill Sienkiewicz (Spelled it right this time)…is awesome. He inspired this cover, for Adequacy No. 400. Bill Sienkiewicz is a comics god. When he is on…he is crazy spot on. When I noticed Adequacy 400 was coming up, I was put in the mind of one of my favorite single issues ever, Batman No. 400, from 1986. Not Detective Comics 400, but Batman. Foreword by Stephen King, and a tale told by multiple creators. It was awesome. I still love it. I compared it to the Odyssey by Homer in college. It was epic, it was tragic, it was fun, it was a done in one double sized single story extravaganza. So I felt I needed to compositionally reference it, above. Many of the ongoing characters and concepts of Adequacy’s first Year and a half are depicted…the Mathlete, who still has at least one Death, The CEO of Pledge LA, Pledge LA HQ, A Union Darth, Skully the Ghost Writer’s Head, and our hero herself. It was a lot of effort, and I love it. I loved doing it. I was considering referencing Frank Miller, who I think isn’t so hot now, but defined areas of the genre when Reagan was in office. I was going to do that with Sin City style color referencing, which I opted against, but can show below, because it’s a special issue, which needs variants (everyone has been telling me that). Not quite Frank Miller’s “one color” effect, but still a powerful way to separate our hero and Skully from the rest. 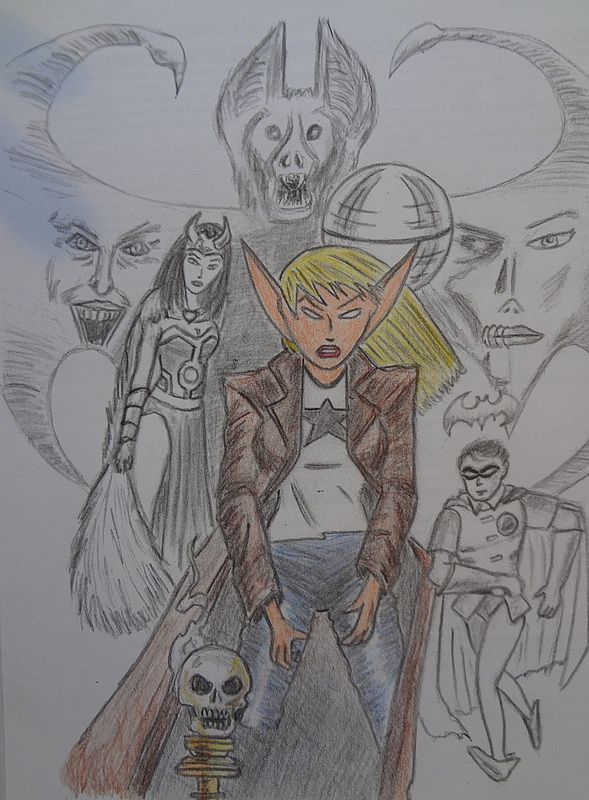 The art, which I shared with my students, blew them away, which I found odd. They see me drawing all the time, and are more or less desensitized to it. To them, I can just draw what I see, which I wish was true. 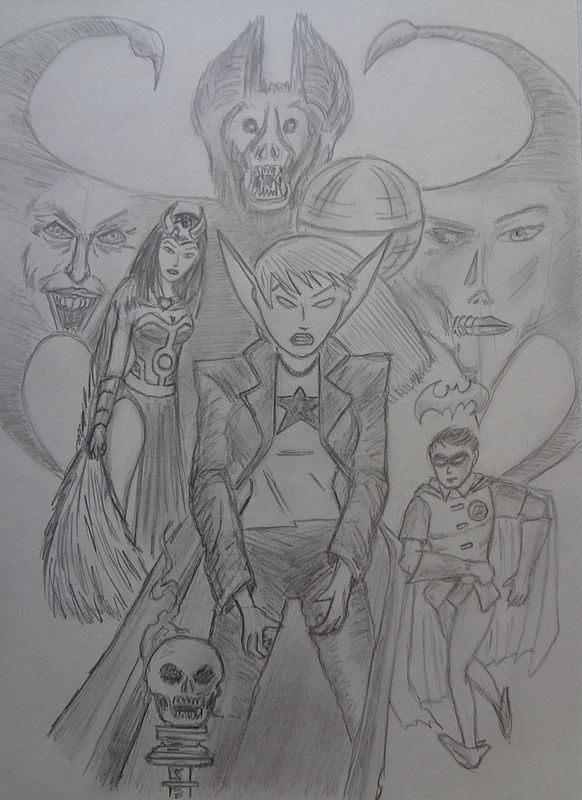 As the bat in the background took shape, monstrous and scary as opposed to a Halloween bat, they really got into it. I did as well, because to be fair, the damn bat was the hardest part. I didn’t even add color at all to the weekend, so the students only saw a portion of the image below, before I came back to school with the color done. I thought the evolutionary process of the piece was interesting, hence taking the progress photos. The Original Pencils, untouched by color. That makes a cool black and white variant. However this…this is the biggest single project in any kind of written form, that I have undertaken. If each post is a page, it is considerably larger than my master’s thesis. Larger, if not considerably so, than the web page for Public School Choice, combined with the proposal my co-teacher and I slaved over. 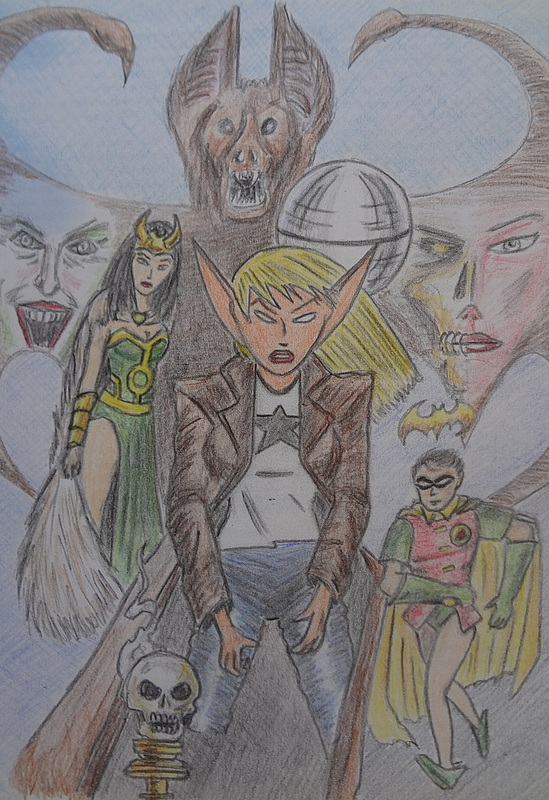 The process of trying to depict teacher meetings, and adult issues on an urban campus, in the form of satirical superhero comics has refined my drawing in ways that years of sketchbooks have not been able to. In short…I love this weird pursuit. I worry that at times it might get repetitive, because school years do. This plotline, the CST Exam, is the second time our hero (still nameless, although Horsey has called her “boss” and “Cap”) has dealt with the flaming cosmic bird of standardized testing. This second time around, with CST Writing, Skully became a breakout character, with the second most popular posting out of Four Hundred. However, the infusion of comics industry material, and the fact that education is changing around us, provides new plots as well. “I’ll Blend Your Learning,” with the Edumentals, was a major plotline, which has a final epilogue coming this week. Very final. However Common Core curriculum has been teased, and the SIG II Grant exists…so really, I’m sure there are new things for our hero to do. Much like Batman has to beat up clowns every now and then, some enemies will come up constantly, while new ones will arrive. I look forward to that part. Some days, Adequacy is what carries me through the boring adult meetings all teachers sit through. Tomorrow, my students take the CST, by which I will be judged as a teacher. 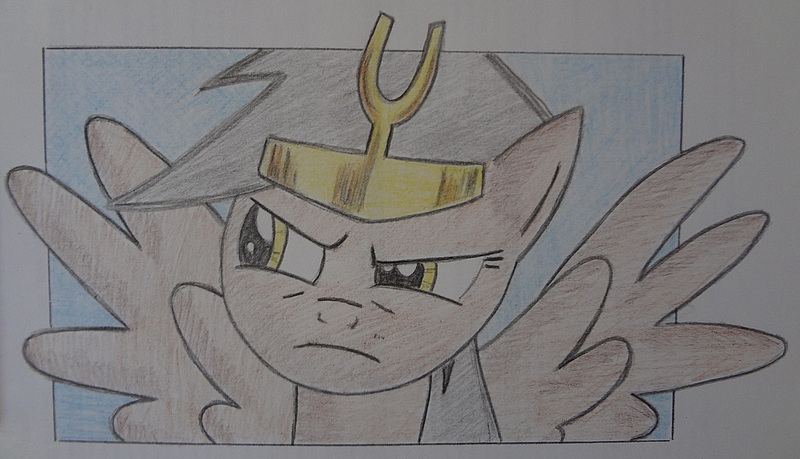 Our new character, Pony, who grew out of both my fascination with Bronyism, and my students actual love of the show being used as a motivator…our new character is pretty mad about the interruption to the CST plot. It makes sense, since Pony is all about motivating students to do well on the CST Exam. 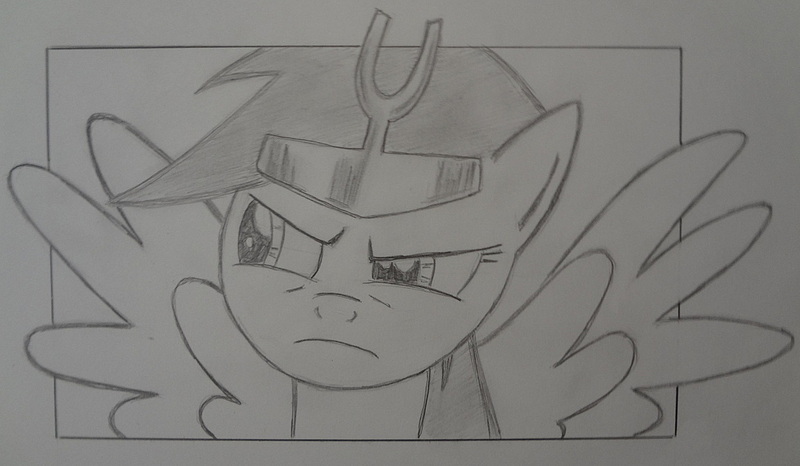 As a result, I have a panel of Pony, peeved about the interrupted service here at Tales of Adequacy. Pony is not happy. There is serious business to be dealt with. This is almost a whole other variant, really. Being No. 400, I felt like I needed “reader incentive graphics. To be fair, the response to Pony has been controversial, but more of you like Pony than don’t. Huge numbers of my students are now wearing Pony buttons with CST slogans on them, as a motivator. You want good comedy? Check the meanest kid in the Seventh Grade, happily wearing a Pony button. Gives you faith in humanity. Untouched, and un-retouched. So there. Later in the week, I’m going to explain how Shepard Fairey (of the Obama “Hope” poster I love to reference so much) has actually become relevant both to my class, and my school district in general. I’m a bit critical, but it gave me an excellent lesson plan for testing week, so not hugely so. However, with Shepard Fairey as an inspiration for the week, as Bill Sienkiewicz was an inspiration for the main art today, I felt that I should give him his props by running the Obama filter. Platform? Friendship. I get behind that candidate, bro. From our hero and myself, thanks for reading Tales of Adequacy.